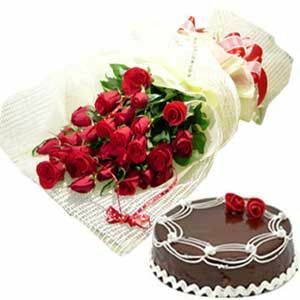 Bunch of 18 fresh exotic Red Roses with seasonal ferns n fillers and rich n delicious 1kg Chocolate Cake. Please note that Flowers, Cakes, Chocolates and other perishable products are sourced locally at the delivery location & will be hand delivered. Cake shape, decoration and icing may differ from the image displayed, The image displayed in indicative in nature. Actual product may vary in shape or design as per the availability. But we always try to send exact products. In case of floods/ Heavy Rains/ National Bandh, Local Festivals, we reserve the right to reschedule the delivery for another date and time. we will replace another product with same quality and quantity, if original product not available. 1) Wrong phone or Cell or Extension number/not working/no reply or not connecting/reachable and delivery is not done. 2) Recipient refused the products. 3) Delivered the product at the Gate/ Reception/ Neighbor. Complain will be taken under consideration if it comes to us within 24 hours of delivery.